As opposed to Microsoft crash reporting module, which behaves differently from one version of Windows to another, WinCrashReport allows you to get the same report format for all versions of Windows, starting from Windows 2000 and up to Windows 7. 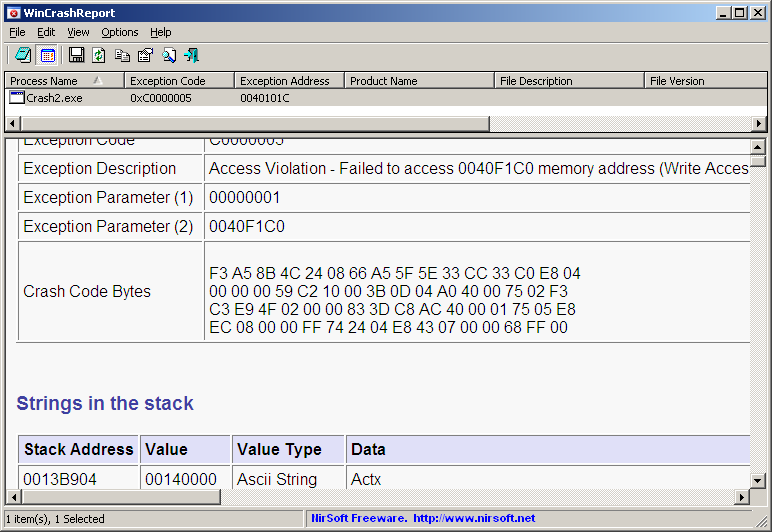 It also allows you to easily save the crash report into text file or HTML file. For more information this new utility, click here. Posted by NirSoft on August 26, 2011 at 10:13 am under Utilities Update. WakeMeOnLan is a new utility that allows you to easily turn on one or more computers on your network, by sending Wake-on-LAN (WOL) packet to these computers. I originally promised to create this utility during year 2010 , but in the end, I created other utilities instead of this one. But… the release of Wireless Network Watcher utility a few weeks ago, gave me a new opportunity to revive the development of WakeMeOnLan, simply because I found out that I can use the scanner of Wireless Network Watcher with only a few adjustments, as the base for the WakeMeOnLan tool. You can download the new WakeMeOnLan utility from this Web page. Posted by NirSoft on August 18, 2011 at 8:33 am under Utilities Update. DomainHostingView is a new utility for Windows that collects extensive information about a domain by using a series of DNS and WHOIS queries, and generates HTML report that can be displayed in any Web browser. The hosting company or data center that hosts the Web server, mail server, and domain name server (DNS) of the specified domain. The created/changed/expire date of the domain. Domain registrar that registered the domain. List of all DNS records, including the PTR records (Reverse DNS lookup) of all IP addresses used by this domain. Raw WHOIS records of the IP addresses found in the DNS records. You can download the DomainHostingView utility from this Web page. Posted by NirSoft on August 10, 2011 at 11:17 am under Utilities Update. 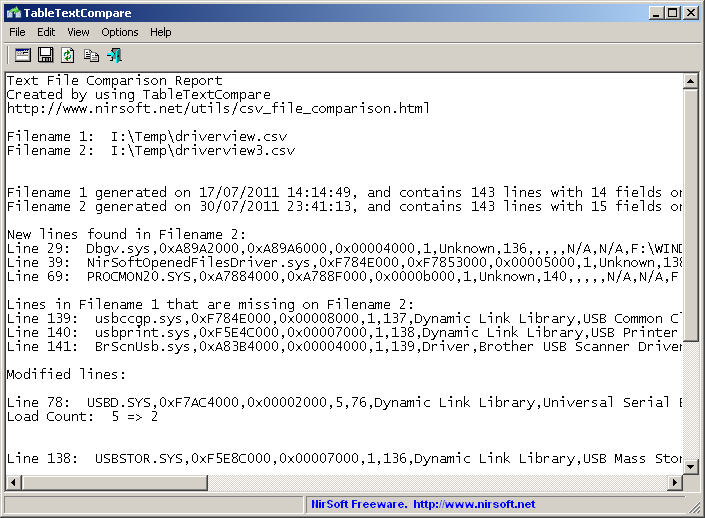 You can also use this utility to compare csv/tab-delimited files created by any other software, like Microsoft Excel. Posted by NirSoft on August 4, 2011 at 4:21 am under Utilities Update.